The Norco Universal Quad Cuff is ideal for persons with limited hand function. 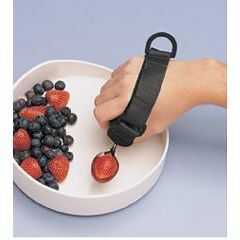 Securely holds various sized handles, including feeding utensils, writing instruments and grooming aids. Cylindrical foam offers a padded palmar area that naturally fits the arches of the hand. Cuff secures to the hand using a D-ring hook and loop strap for independent donning and doffing. One size fits all. First time in 12 years that dad tried to eat on his own. Great product, easy to use. Wooden Dowel Quite Large. Overall Cuff is Large. Hard to put utensil in. Hard to put utensil in. Hard to put utensil in. In looking at the picture in the online catalog you have no idea that a wooden dowel is used. Will be used for all things requiring holding in my hand. MS Patients. Quad clients. Elderly. This is a great product to use for writing or eating utensils, painting, and also to help shave, etc it is something to help people become more independant.